Hey guys, happy Monday, I am back to school for one last term, wohoo! Today I have two gorgeous nail polishes from an awesome not so indie indie brand called Rainbow Honey, which is now available at Nail Polish Canada (free Canadian shipping, no minimum). Lifestream ($11.50) is a gorgeous glitter polish packed with iridescent/translucent green and white bar and hexagon glitters of various sizes. The clear base is of perfect consistency so a good amount of glitter can be applied with each stroke. I used around one coat on each nail over a lavender creme base from Julep called "Renee". The drying time is good and something about this glitter screams Easter. I love how all the glitters shift from lavender to pastel green, pink, and orange under the light. Next up is "The Kraken" ($11.50), despite its name, the polish is more reminiscent of the a mermaid's tail than the legendary sea monster. In fact, I would say this is the "mermaidest" polish I own! The polish consists of gold and blue hexagon glitters of various sizes suspended in a gorgeous sea blue jelly. The polish has a thick consistency which actually aids the application of the glitter because with polishes that have big glitters, thin base formula makes it difficult for the glitter to adhere to the nail and several coats would be needed. For my swatches I used two coats. The drying time is decent for a jelly and a topcoat is needed to smooth out the glitter. So which one do you like better, I definitely see my self sporting "Lifestream" during spring and "The Kraken" during the summer! 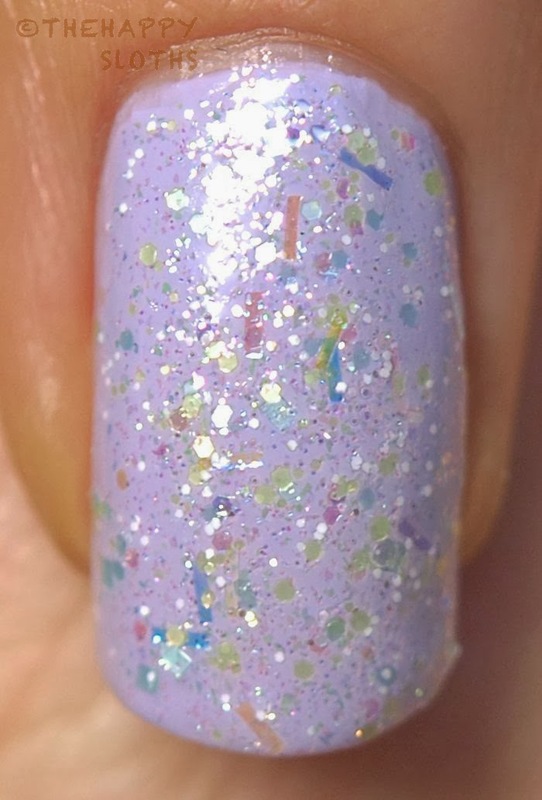 Check out the rest of Honey Rainbow's amazing polishes on Nail Polish Canada (free Canadian shipping with no minimum)!